MAE WEST was often mentioned in the gossip column "Going Hollywood" penned by May Mann. Why not celebrate some females named for the merry month, the fifth calendar month of the year? • • Born as May Vasta Randall, her pen name became May Mann [1 September 1908 — 15 April 1995]. May began her journalism career in 1934 as a society columnist for The Ogden Standard-Examiner in her hometown Ogden, Utah. • • Hollywood, Sept. 22 — — Mae West won't have to worry about getting a job now: she's formed her own movie production company. Mae West Empire Pictures Co., James Timony, Mae's business manager said today, was incorporated at Sacramento, the state capitol, with Louis R. Lurie of Sacramento, as president. Mae is a vice president of the $5,000,000 corporation. • • Timony said the firm would make four films a year, two of them starring Mae West, and that the first would have Mae seen onscreen as "Catherine the Great." • • Source: Item by May Mann in The Ogden Standard-Examiner (Ogden, Utah); published on Thursday, 22 September 1938. • • On Friday, 10 May 1935 Frank Wallace filed a lawsuit in Los Angeles, California against Mae West declaring she was damaging his reputation and his professional standing by denying they had wed. The movie star spent quite a long time continuing to refute the entire idea of marrying such a person. • • On Friday, 10 May 1935, "Goin' to Town" opened in Mae West's hometown at the New York Paramount. • • On Monday, 10 May 1948, screen siren Mae West took her seat at Brighton’s Theatre Royal for the European premiere of ‘Ladies, Please!’ She co-wrote the play and was in town to attend its European premiere, bringing with her a dash of Hollywood glitz and glamour. And, judging by reviews published in local papers, the play was an ideal tonic for a town still in the grip of rationing and other post war austerity measures. • • Elsa Schiaparelli's heyday was in the 1930s while she worked out of Paris and dressed Hollywood stars like Mae West, Katherine Hepburn, and Marlene Dietrich. • • Mae West said: "Let's get to work!" • • Thursday and Friday, May 5-6. Double bill. 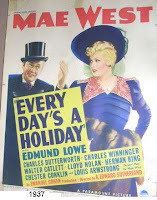 Mae West in “Every Day's A Holiday.” Mae West in another uproarious story of the gay nineties. 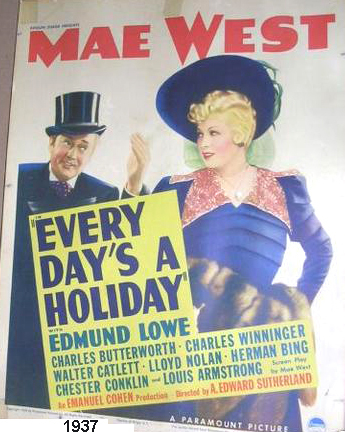 Edmund Lowe is her boy friend in this. • • The Mae West Blog was started ten years ago in July 2004. You are reading the 3438th blog post. Unlike many blogs, which draw upon reprinted content from a newspaper or a magazine and/ or summaries, links, or photos, the mainstay of this blog is its fresh material focused on the life and career of Mae West, herself an American original.